Arm flapping or hand flapping are classic autistic behaviors, but that doesn't mean your child has autism if she does this occasionally. Normal children may flap their hands or arms when they get excited. If you suspect your child has autistic behaviors, arrange to have her evaluated by a specialist in autism and watch for other typical signs of the disorder. The 2006 Centers for Disease Control and Prevention show that approximately one in 110 children in the United States falls on the autism spectrum, which also includes less severe disorders such as Asperger syndrome. Hand or arm flapping is one of the odd, repetitive actions of autism spectrum disorders, along with walking on the toes, spinning or rocking that catches a parent's attention at an early age. Along with a disinterest in people, unusual preoccupations, odd speech patterns, problems understanding social cues and difficulty controlling emotions, hand flapping can be a cue that something isn't right with your child. On the other hand, many normal children flap their hands or arms with excitement at various times and walk on their toes until they learn to walk well. You can't diagnose autism or autism spectrum disorders just from hand flapping. 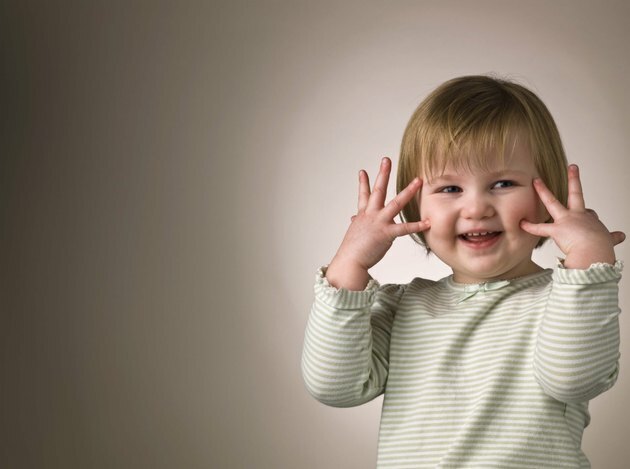 Children may flap their arms to express excitement before they have the words to use to express their emotions. Arm flapping can become a habit when your child gets excited, even after he learns to talk. Children with autism flap their arms more often as a type of self-stimulation and in a more repetitive way than a normal child who flaps their arms occasionally out of excitement. Since hand flapping is just one of many behaviors children on the autism spectrum exhibit, pay attention to your child's other behaviors to see if he needs evaluation. Hand flapping is a hard-to-miss gesture, while more subtle signs of autism related to speech, such as the ability to answer questions after a certain age or to respond to questions in a non-rote fashion may take more careful observation. Hand flapping that continues more than a few months or that intensifies requires evaluation. Autism is hard to diagnose before the age of 3, according to the Bright Tots website. Talk to your child's pediatrician but make sure to document all the behaviors that contribute to your concern and make your concerns very clear. Pediatricians fail to diagnose autism in 83 percent of cases, according to the National Alliance on Mental Illness of North Carolina.